A solar eclipse occurs when the moon blocks any part of the sun. On Monday, August 21, 2017, a solar eclipse will be visible (weather permitting) across all of North America. The whole continent will experience a partial eclipse lasting 2 to 3 hours. 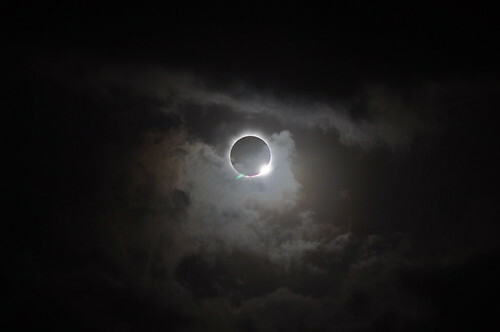 Halfway through the event, anyone within a roughly 70-mile-wide path from Oregon to South Carolina will experience a brief total eclipse, when the moon completely blocks the sun’s bright face for up to 2 minutes 40 seconds, turning day into night and making visible the otherwise hidden solar corona — the sun’s outer atmosphere — one of nature’s most awesome sights. Bright stars and planets will become visible as well! Carefully read these eclipse safety guidelines – from NASA. Looking directly at the sun is unsafe except during the brief total phase of a solar eclipse (“totality”), when the moon entirely blocks the sun’s bright face, which will happen only within the narrow path of totality. The only safe way to look directly at the uneclipsed or partially eclipsed sun is through special-purpose solar filters, such as “eclipse glasses” or hand-held certified solar viewers. Homemade filters or ordinary sunglasses, even very dark ones, are not safe for looking at the sun. Filtering – Eclipse Glasses: NASA recommends welder’s glasses rated 14 or higher. These can be found at your local welding supply store. If you are within the path of totality, remove your solar filter only when the Moon completely covers the sun’s bright face and it suddenly gets quite dark. Experience totality, then, as soon as the bright sun begins to reappear, replace your solar viewer to glance at the remaining partial phases. A solar eclipse is one of nature’s grandest spectacles. By following these simple rules, you can safely enjoy the view and be rewarded with memories to last a lifetime! Next post: 70 Years and Counting!